China and the United States are both good investment destinations. China has been the fastest growing source of FDI to the United States. US and China to promote two-way investment and strengthen bilateral economic ties. [dropcap color=”#008040″ boxed=”yes” boxed_radius=”8px” class=”” id=””]S[/dropcap]enior officials from China and the United States on Tuesday urged the world’s two largest economies to conclude their investment treaty talks to promote two-way investment and strengthen bilateral economic ties. 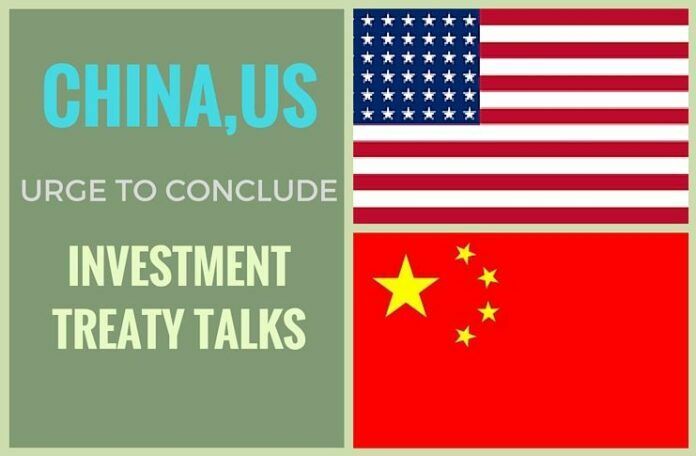 “Last week, a new round of negotiations (on the bilateral investment treaty) was held in Washington D.C., and the two sides exchanged their negative list offers for the third time, which is another major step forward,” Wu Xi, Minister of Chinese Embassy in the United States, said at the 2016 Select USA Reception, co-hosted by the embassy and the China General Chamber of Commerce-USA (CGCC), which represents Chinese enterprises in the United States. A negative list outlines sectors closed to foreign investment. The last time the two sides exchanged such lists was in early September last year. ” A total of 25 rounds of investment treaty talks have been held since negotiations started in 2008. China and U.S. officials have signaled a willingness to finalize a deal before U.S. President Barack Obama leaves the White House in January 2017. “A high-level China-U.S. investment treaty will effectively provide a legal framework and strong impetus for two-way investment in China and the United States,” Wu told over 450 business representatives and officials from both countries on the sidelines of the two-day Select USA Investment Summit hosted by the Obama administration. [dropcap color=”#008040″ boxed=”yes” boxed_radius=”8px” class=”” id=””]W[/dropcap]ith so many Chinese investors at this year’s summit, it’s no wonder that China has been the fastest growing source of FDI (Foreign Direct Investment) to the United States,” said Bruce Andrews, Deputy Secretary of U.S. Commerce Department, adding that China tops the list of delegations for the summit with over 140 investors. “Let me be clear, the United States is fully committed to enjoying a long-standing open investment policy, and to providing national treatment to investors from China,” he said, encouraging Chinese companies to take advantage of many resources offered by the Select USA, a government-wide initiative aimed at facilitating and accelerating international investment in the United States, this week and beyond. ” Max Baucus, U.S. Ambassador to China, said he hoped the two countries could reach a bilateral investment treaty (BIT) so that investors can invest more easily in each other’s country, which is very important for the China and U.S. economies. “As China-U.S. business cooperation continues to develop, a top priority for policymakers on both sides of the Pacific should be the pursuit of a high-standard and transparent bilateral investment treaty that will meet the expectations of all companies,” said the CGCC, in a newly-released report. [dropcap color=”#008040″ boxed=”yes” boxed_radius=”8px” class=”” id=””]B[/dropcap]aucus also said he remains “bullish” on China-U.S. relations no matter who is elected as the next president of the United States in November. Leaders of both countries have recognized that the Chinese and American people essentially have the same aspirations for living a better life with clean water, safe food, good education and health care, he said. Wu noted that “the closer and mutually beneficial cooperation” among Chinese and U.S. businesses will also help extend and deepen the relationship between the two countries. ” U.S. Trade Representative Michael Froman said Monday that the United States is in the process of assessing the Chinese new negative list offer. He said investment treaty talks will continue into the fall. “I think if we can achieve a high-standard agreement you’re moving from a world in which everything is prohibited unless it’s expressly approved to one where everything’s approved unless expressly regulated or prohibited. And that’s a significant change in terms of getting the government out of the business of managing the economy,” Froman said. SEBI says P-Notes are declining but why is the Stock Market going up?